I am truly honored to serve as your 2018 ASHG president. I have been involved with the Society for some 30 years – including serving on the Program Committee and as Board Secretary, on the editorial board of The American Journal of Human Genetics, and most recently as AJHG Editor – and am looking forward to working with you in this new role. David Nelson, PhD, presents at the ASHG Business Meeting in October 2017. During that long involvement, human genetics has changed in exciting ways, and the science continues to advance at a pace that is challenging to keep up with. It’s vital that ASHG evolves to keep pace with its members, and a key focus for the upcoming year is to better understand and more effectively address members’ needs. This will involve both reflecting changes in the field and taking an active role in its continued progress. Recognizing the penetrance of genetics into other areas, I look forward to forging partnerships with related fields and organizations. Our varied programs reflect our values as scientists and geneticists. Every fall, the Annual Meeting gets to the core of our purpose as a Society: to bring the genetics and genomics community together to exchange ideas, methods, findings, and approaches. Our increasing involvement in policy and advocacy addresses the growing prominence of genetics in broader society. And our educational programs for trainees and K-12 students reflect our commitment to the next generation and future of our science. In 1974, when I took a course in human genetics as a senior undergraduate using Curt Stern’s classic textbook, understanding the complete set of genes that compose humans was a far-off dream, limited by technologies yet to be discovered or invented. Within 25 years, the dream was fulfilled, and the field is now making significant headway toward therapeutically correcting mutations in humans. It has been an immense privilege to have contributed to some of these advances and to have been able to highlight the work of others through AJHG. What will the next 25 years hold? 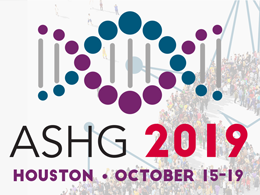 ASHG must continue to be at the forefront of educating the public as we wrestle with the implications of these advancements, just as it has been from its beginnings in the 1940s. Discoveries will continue to present our field with challenges in education and advocacy, and the members of ASHG will be vital for meeting those challenges. David L. Nelson, PhD, is 2018 President of ASHG. He is a Cullen Foundation Professor of Molecular and Human Genetics at the Baylor College of Medicine, Associate Director of the BCM Intellectual and Developmental Disabilities Research Center, and Director of the BCM Integrative Molecular and Biomedical Sciences Graduate Program.